Free Wi-Fi with iPass for 1 month redeemable at more than 64 million hotspots around the globe when you rent a midsize car or larger for 3+ days. * when you travel to the U.S.
Getting your Wi-Fi voucher code is easy. Pay Later with PC# 204685 to receive your 1 month free Wi-Fi with iPass at booking. Reward will be delivered via email no later than 7 days after reservation. Promotion cannot be combined with other discounts, promotions, or rates. Promotion can be combined with contracted benefits if applicable. 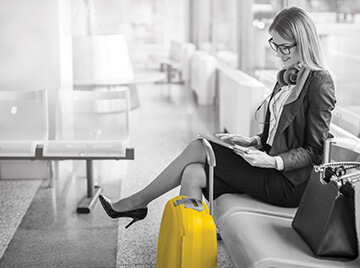 *Only Customers who rent an intermediate car class or larger for at least three days and receive an email from Hertz Rewards qualify for a reward. Reward is defined as one (1) month of free Wi-Fi to be used on www.iPass.com/Hertz. Voucher Codes expire 60 days from claiming. Reward is subject to change and while supplies last. Must be 18+. Promotion valid in the United States, excluding territories and possessions. Limit one (1) Reward per Customer name, per Customer email address, and per Customer household. Reward cannot be combined with any other offers or discounts. Additional restrictions apply. See Terms for complete details.